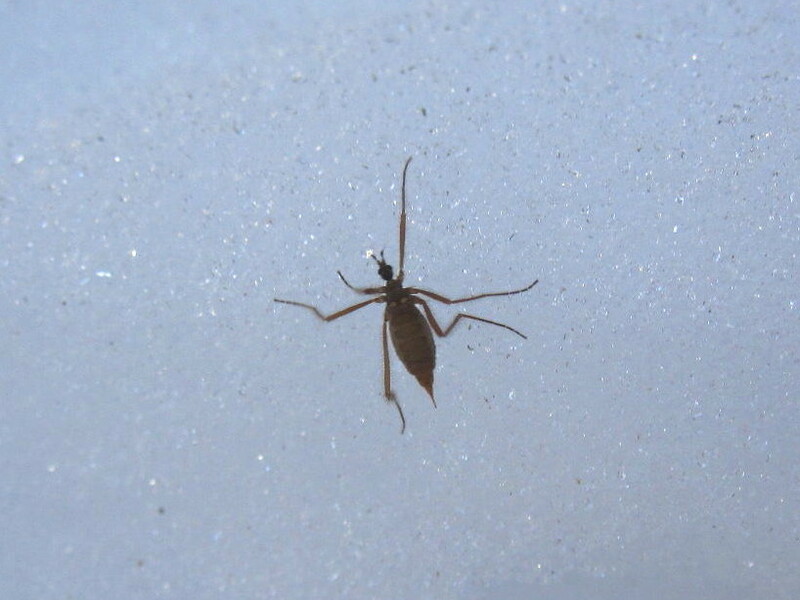 The January thaw hit Lake Wicwas this week, and it isn't pretty. At least we had enough snow in December that the landscape is still mostly white, but it won't last if this weather keeps up. The lake has standing water on it, and has had a dense layer of fog hanging above it for the past two days. In fact, multiple layers of fog due to the colder temperature right at the surface of the ice. Travel up in elevation a thousand feet or so, and the picture changes. 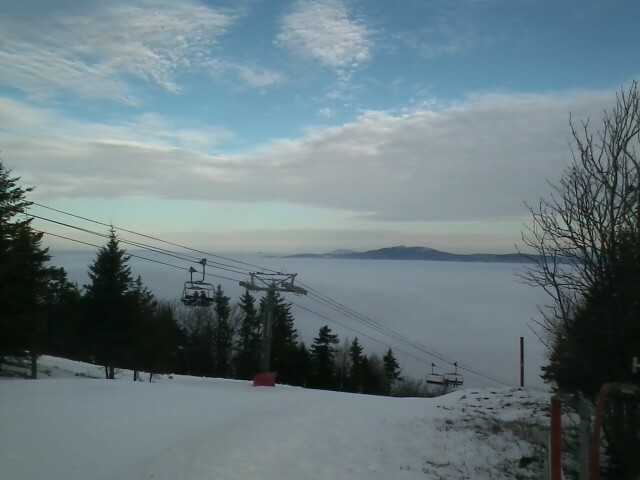 The warm air riding over colder air at the surface created the fog through a tempertuare inversion. 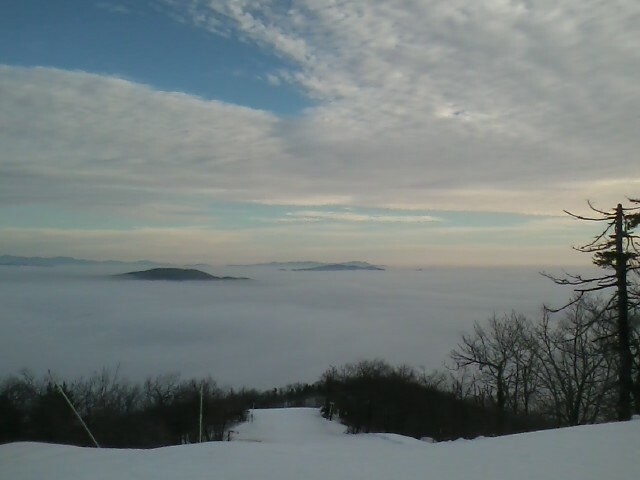 From the top of Ragged Mountain, looking over towards lake Wicwas, it looked like an ocean of clouds with mountain tops sticking up like islands. Lake Wicwas is somewhere under that thick blanket. This is the view looking north towards Mount Cardigan. Warm and sunny on the mountain top, damp and dreary in the valley - that's New England! Back, on January 5th, a rather cold day, I found this tiny insect on the snow - it's about a half an inch long. I don't know what it is, and I have no idea why it was out on a winter day when the temperature was only 30 degrees. I put out some acorns for the animals during the cold snap after the snow we had. They have been appreciated by the turkeys and the squirrels, and then yesterday we had a deer or two enjoying them. Acorns are one of the most nutritious and important winter food sources for many animals. Although acorns - as well as oak buds - contain high levels of tannins (up to 9% - they were used in leather tanning!) and other potent toxins that humans can't process, some animals have evolved over time with organs that manufacture enzymes that break down and metabolize those toxins. It's part of the battle between the self-protection systems of plants and the evolution of animals. Plants create toxins to prevent them from being eaten, and over time, herbivores develop mechanisms that protect them from these assaults. One reason deer have such a varied diet is because they eat slow-growing plant tissues which tend to have high levels of toxins: acorns, leaves, hemlock needles. By varying their diet and eating only small amounts of each food, they prevent the toxins from overloading their internal defensive organs. 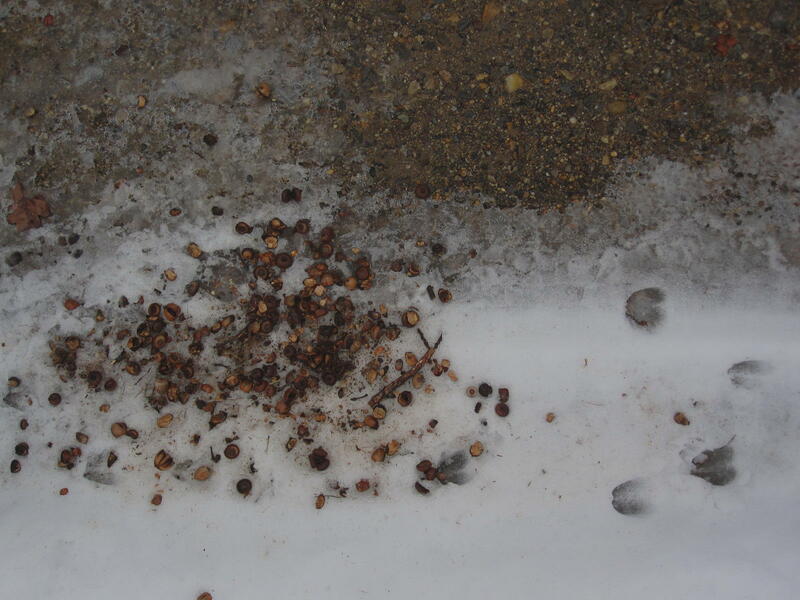 Thus the deer have left some acorns for later. Of course some animals, squirrels for one, play an important part in dispersing the oak tree's genes by carrying their seeds away and hiding them in the ground. Those they lose track of and never harvest spread the oak's DNA farther than the tree could accomplish on its own. Deer help as well, by stepping on some seeds, pressing them into the ground - as seen above - helping them to germinate in the spring. But, if we don't get more snow soon we won't be doing any more tracking - let's hope winter returns soon!